Both food infections and food intoxications can create a burden on health systems, when patients require treatment and support, and on food systems, when companies must recall contaminated food or address public concerns. It all begins with the agent that causes the contamination. When a person ingests a food contaminant, it travels to the stomach and intestines. There, it can interfere with the body’s functions and make you sick. In the next part, we will focus on different types of food contaminants and examine common microbes, toxins, chemicals, and other substances that can cause food infections and intoxications. Let’s begin with pathogens, which include bacteria and viruses. About one hundred years ago, typhoid fever, tuberculosis, and cholera were common diseases caused by food and water contaminated by pathogens. Over time, improvements in food processing and water treatment eliminated most of those problems in North America. Today, other bacteria and viruses have become common causes of food infection. All foods naturally contain small amounts of bacteria. However, poor handling and preparation of food, along with improper cooking or storage can multiply bacteria and cause illness. In addition, bacteria can multiply quickly when cooked food is left out at room temperature for more than a few hours. Most bacteria grow undetected because they do not change the color or texture of food or produce a bad odor. Freezing and refrigeration slow or stop the growth of bacteria, but does not destroy the bacteria completely. The microbes can reactivate when the food is taken out and thawed. Many different kinds of bacteria can lead to food infections. One of the most common is Salmonella, which is found in the intestines of birds, reptiles, and mammals. Salmonella can spread to humans via a variety of different animal-origin foods, including meats, poultry, eggs, dairy products, and seafood. The disease it causes, salmonellosis, typically brings about fever, diarrhea, and abdominal cramps within twelve to seventy-two hours after eating. Usually, the illness lasts four to seven days, and most people recover without treatment. 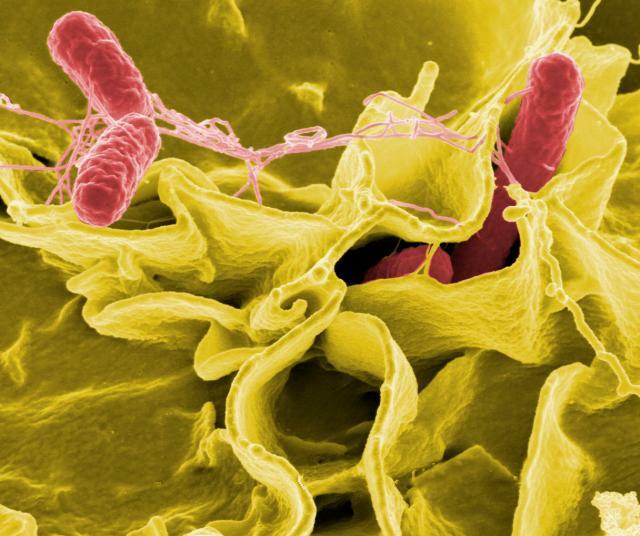 However, in individuals with weakened immune systems, Salmonella can invade the bloodstream and lead to life-threatening complications, such as a high fever and severe diarrhea. The bacterium Listeria monocytogenes is found in soft cheeses, unpasteurized milk, meat, and seafood. It causes a disease called listeriosis that can bring about fever, headache, nausea, and vomiting. Listeria monocytogenes mostly affects pregnant women, newborns, older adults, and people with cancer and compromised immune systems. The food infection by Escherichia coli is found in raw or undercooked meat, raw vegetables, unpasteurized milk, minimally processed ciders and juices, and contaminated drinking water. Symptoms can occur a few days after eating, and include watery and bloody diarrhea, severe stomach cramps, and dehydration. More severe complications may include colitis, neurological symptoms, stroke, and hemolytic uremic syndrome. In young children, an E. coli infection can cause kidney failure and death. The bacterium Clostridium botulinum causes botulism. Sources include improperly canned foods, lunch meats, and garlic. An infected person may experience symptoms within four to thirty-six hours after eating. Symptoms could include nerve dysfunction, such as double vision, inability to swallow, speech difficulty, and progressive paralysis of the respiratory system. Botulism can also be fatal. Campylobacter jejuni causes the disease campylobacteriosis. It is the most commonly identified bacterial cause of diarrhea worldwide. Consuming undercooked chicken, or food contaminated with the juices of raw chicken, is the most frequent source of this infection. Other sources include raw meat and unpasteurized milk. Within two to five days after consumption, symptoms can begin and include diarrhea, stomach cramps, fever, and bloody stools. The duration of this disease is about seven to ten days. The food infection shigellosis is caused by Shigella, of which there are several types. Sources include undercooked liquid or moist food that has been handled by an infected person. The onset of symptoms occurs one to seven days after eating, and can include stomach cramps, diarrhea, fever, and vomiting. Another common symptom is blood, pus, or mucus in stool. Once a person has had shigellosis, the individual is not likely to get infected with that specific type again for at least several years. However, they can still become infected with other types of Shigella. Staphylococcus aureus causes staphylococcal food poisoning. Food workers who carry this kind of bacteria and handle food without washing their hands can cause contamination. Other sources include meat and poultry, egg products, cream-filled pastries, tuna, potato and macaroni salad, and foods left unrefrigerated for long periods of time. Symptoms can begin thirty minutes to eight hours after eating, and include diarrhea, vomiting, nausea, stomach pain, and cramps. This food infection usually lasts one to two days. Found in raw oysters and other kinds of seafood, Vibrio vulnificus belongs to the same family as the bacteria which cause cholera. This food contaminant can result in the Vibrio infection. Symptoms can begin anywhere from six hours to a few days after consumption, and include chills, fever, nausea, and vomiting. This disease is very dangerous and can result in fatalities, especially in people with underlying health problems. Viruses are another type of pathogen that can lead to food infections, however they are less predominant than bacteria. Viruses differ from bacteria in that they cannot grow and reproduce in foods. Instead, viruses that cause human diseases can only reproduce inside human cells (see Figure 15.1 “Viruses in the Human Body”). Hepatitis A is one of the more well-known food-contaminating viruses. Sources include raw shellfish from polluted water, and food handled by an infected person. This virus can go undetected for weeks and, on average, symptoms do not appear until about one month after exposure. At first, symptoms include malaise, loss of appetite, nausea, vomiting, and fever. Three to ten days later, additional symptoms can manifest, including jaundice and darkened urine. Severe cases of a hepatitis A can result in liver damage and death. The most common form of contamination from handled foods is the norovirus, which is also known as the Norwalk-like virus, or the calicivirus. Sources include raw shellfish from polluted water, salads, sandwiches, and other ready-to-eat foods handled by an infected person. The norovirus causes gastroenteritis and within one to three days it leads to symptoms, such as nausea, vomiting, diarrhea, stomach pain, headache, and a low-grade fever. Food-contaminating parasitic protozoa are microscopic organisms that may be spread in food and water. Several of these creatures pose major problems to food production worldwide. They include Anisakis, microscopic worms that invade the stomach or the intestines. Sources of this parasite include raw fish. This parasite can result in the Anisakis infection, with symptoms that begin within a day or less and include abdominal pain, which can be severe. Cryptosporidium lives in the intestines of infected animals. Another common source is drinking water, when heavy rains wash animal wastes into reservoirs. One major problem with this pathogen is that it is extremely resistant to disinfection with chlorine. Cryptosporidium causes the disease cryptosporidiosis, with symptoms that begin one to twelve days after exposure and include watery stools, loss of appetite, vomiting, a low-grade fever, abdominal cramps, and diarrhea. For HIV/AIDS patients and others with weakened immune systems, the disease can be severe, and sometimes can lead to death. Giardia lamblia is another parasite that is found in contaminated drinking water. In addition, it lives in the intestinal tracts of animals, and can wash into surface water and reservoirs, similar to Cryptosporidium. Giardia causes giardiasis, with symptoms that include abdominal cramping and diarrhea within one to three days. Although most people recover within one to two weeks, the disease can lead to a chronic condition, especially in people with compromised immune systems. The parasite Toxoplasma gondii causes the infection toxoplasmosis, which is a leading cause of death attributed to foodborne illness in the United States. More than sixty million Americans carry Toxoplasma gondii, but very few have symptoms. Typically, the body’s immune system keeps the parasite from causing disease. Sources include raw or undercooked meat and unwashed fruits and vegetables. Handling the feces of a cat with an acute infection can also lead to the disease. 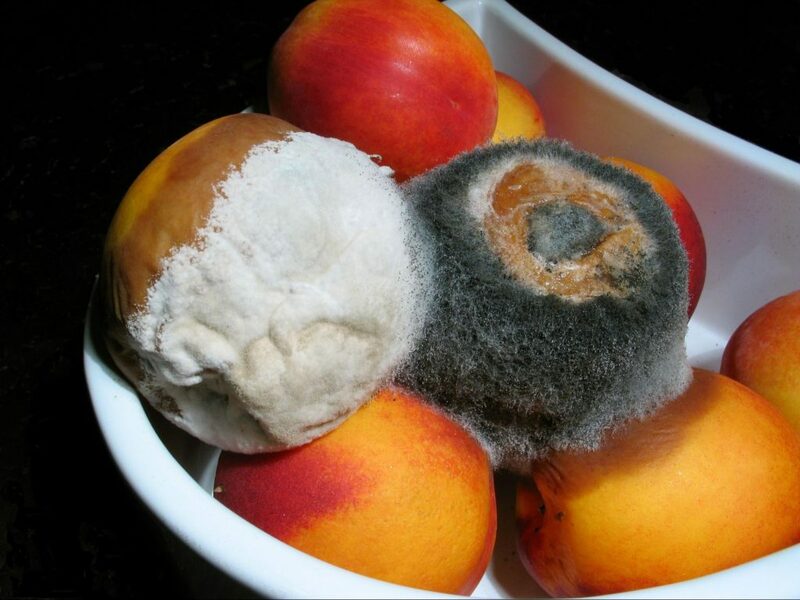 Warm, humid, or damp conditions encourage mold to grow on food. Molds are microscopic fungi that live on animals and plants. No one knows how many species of fungi exist, but estimates range from ten- to three-hundred thousand. Unlike single-celled bacteria, molds are multicellular, and under a microscope look like slender mushrooms. They have stalks with spores that form at the ends. The spores give molds their color and can be transported by air, water, or insects. Spores also enable mold to reproduce. Additionally, molds have root-like threads that may grow deep into food and be difficult to see. The threads are very deep when a food shows heavy mold growth. Foods that contain mold may also have bacteria growing alongside it. Some molds, like the kind found in blue cheese, are desirable in foods, while other molds can be dangerous. The spores of some molds can cause allergic reactions and respiratory problems. In the right conditions, a few molds produce mycotoxins, which are natural, poisonous substances that can make you sick if they are consumed. Mycotoxins are contained in and around mold threads, and in some cases, may have spread throughout the food. The Food and Agriculture Organization of the United Nations estimates that mycotoxins affect 25 percent of the world’s food crops. They are found primarily in grains and nuts, but other sources include apples, celery, and other produce. The most dangerous mycotoxins are aflatoxins, which are produced by strains of fungi called Aspergillus under certain temperature and humidity conditions. Contamination has occurred in peanuts, tree nuts, and corn. Aflatoxins can cause aflatoxicosis in humans, livestock, and domestic animals. Symptoms include vomiting and abdominal pain. Possible complications include liver failure, liver cancer, and even death. Many countries try to limit exposure to aflatoxins by monitoring their presence on food and feed products. Like molds, mushrooms are fungi and the poisonous kind produces mycotoxins that can cause food intoxication. Toxic mushrooms, also known as toadstools, can cause severe vomiting and other symptoms. However, only a few varieties are fatal. Toxic mushrooms cannot be made safe by cooking, freezing, canning, or processing. The only way to avoid food intoxication is to refrain from eating them. 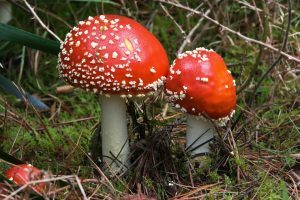 Mushroom guides can help wild gatherers distinguish between the edible and toxic kinds. Pesticides are important in food production to control diseases, insects, and other pests. They protect crops and ensure a large yield. However, synthetic pesticides can leave behind residues, particularly on produce, that can be harmful to human health. Foods that contain the highest levels of pesticide residue include conventionally-grown peaches, apples, bell peppers, celery, nectarines, strawberries, cherries, pears, spinach, lettuce, and potatoes. Foods that contain the lowest levels of pesticide residue include avocados, pineapples, bananas, mangoes, asparagus, cabbage, and broccoli. In many cases, the amount of pesticide exposure is too small to pose a risk. However, harmful exposures can lead to certain health problems and complications, including cancer. Also, infants and young children are more susceptible to the hazards of pesticides than adults. In addition, using synthetic pesticides, herbicides, and fertilizers contributes to soil and water pollution and can be hazardous to farm workers. To protect the public and their workers, many farmers now rely on alternatives to synthetic pesticide use, including crop rotation, natural pesticides, and planting non food crops nearby to lure pests away. Some consumers choose to reduce their exposure to pesticides by purchasing organic produce. Organic foods are grown or produced without synthetic pesticides or fertilizer, and all growers and processors must be certified by the US Department of Agriculture (USDA). However, conventionally-grown produce should be fine for fruits and vegetables that appear on the low-residue list. Pollutants are another kind of chemical contaminant that can make food harmful. Chemical runoff from factories can pollute food products and drinking water. For example, dioxins are chemical compounds created in industrial processes, such as manufacturing and bleaching pulp and paper. Fish that swim in dioxin-polluted waters can contain significant amounts of this pollutant, which causes cancer. When metals contaminate food, it can result in serious and even life-threatening health problems. A common metal contaminant is lead, which can be present in drinking water, soil, and air. Lead exposure most often affects children, who can suffer from physical and mental developmental delays as a result. Methyl mercury occurs naturally in the environment and is also produced by human activities. Fish can absorb it, and the predatory fish that consume smaller, contaminated fish can have very high levels. This highly toxic chemical can cause mercury poisoning, which leads to developmental problems in children, as well as autoimmune effects. A condition called Minamata disease was identified in 1956 in Japan. It was named for the town of Minamata, which was the site of an environmental disaster when methyl mercury was released into the surface water near a factory. Many residents experienced neurological issues, including numbness in hands and feet, muscle weakness, a narrowing of the field of vision, damage to hearing and speech, and ataxia, which is a lack of muscle coordination. PCBs, or polychlorinated biphenyls, are man-made organic compounds that consists of carbon, hydrogen and chlorine. Due to their non-flammability, chemically stable, and high boiling points PCBs were manufactured and used commercially from 1929 until 1979 when it was banned. Like methylmercury, higher concentrations of this contaminant are found in predatory fish. Health effects include complications in physical and neurological development in children, and this compound is potentially a carcinogen. PCB contamination also can affect the immune, reproductive, nervous, and endocrine systems. The Causes of Food Contamination by University of Hawai’i at Mānoa Food Science and Human Nutrition Program is licensed under a Creative Commons Attribution-NonCommercial-ShareAlike 4.0 International License, except where otherwise noted.